The following documents explain the issue well including the concerns of cottagers/residents with properties in the affected zone. Essentially, the concern is that a “housekeeping” change will in fact prevent owners with “grandfathered” structures from changing their buildings in any way which involves removing a wall and would make it easier to extinguish grandfathered rights if a wall were removed. Read the attachments…. The intention is to reline the culvert under Bedford Road commencing after July 1. This project has already been tendered and awarded. The relining of the culvert should take about two weeks. We will be informed when the Township gets the construction schedule from the contractor. Design is being finalized and tender in May at the latest. It is our intention to have the successful contractor mobilize towards the end of August with construction commencing after Labour Day. 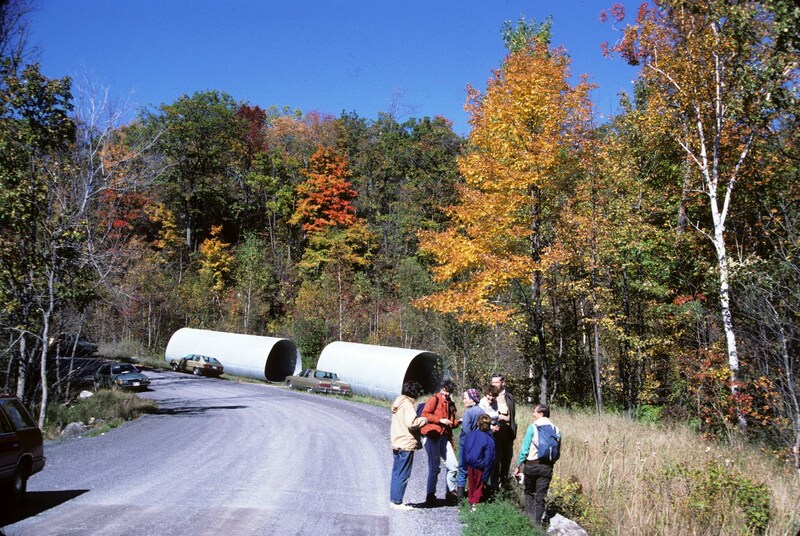 Photo of “new” culverts prior to installation on Bedford Rd. (circa 1987). Courtesy of Simon Smith. I met with McIntosh Perry [consulting engineers] yesterday and they answered all of the questions for the Otter Lake Culvert on Bedford Road. The host pipe is not required to support the liner as we have specified a minimum strength to support the forces. However, other than the invert the host pipe is still in relatively decent shape. Work timeframe – It is anticipated construction will begin after October 1st and everything wrapped up by November 27th. A portage route has been planned as part of the project that will keep the tourists out of the construction zone. It appears there is a currently used route to the North that will be utilized. We did not discuss Salmon Lake culvert as they have not received details about the soil foundations yet from the lab. I had a brief discussion with Laura (at MP) though and it sounds like bedrock much deeper than first anticipated which might create some issues. I will keep you in the loop as things progress. All members, (or designates) and new members are welcome. Please see Edith, our treasurer, to pay your fees, and to get a name tag before the meeting starts. Membership dues are $10.00 per person. Edith will have a table set up inside the main meeting room. Please use the membership form (copy attached), to give us any changes in your information. As many of you will know already, Peter Dawson, the former Superintendent of the Park retired this year. Ben Chabot is the new Superintendent. He has kindly agreed to attend our AGM to meet our group. Mark Segsworth, the Township’s Public Works Manager, will also be attending our meeting and will speak to our group and answer questions you may have in regard to the Township’s plans to replace/repair the culverts in Salmon Lake and Bedford roads. The information we have to date is that nothing will be happening anytime soon. Options include replacing the culverts altogether with new concrete ones of approximately the same dimensions (i.e., canoes and other small watercraft can pass through) and, in the case of the Bedford Rd. culvert (connecting North Otter and Rothwell Lakes) “repairing” the culvert by way of “invert paving”, i.e., laying concrete down at the bottom of the culvert where it is showing the worst signs of damage (rusting through). This year we will have a pot luck lunch again. We encourage all of you to bring a dish of your choice and stay on after the meeting to meet, or catch up with other members on the lake. Please come with any reports of sightings of fauna or flora, issues, or changes to the health of the lake. Thank you and we look forward to seeing you on July 12, 2015.